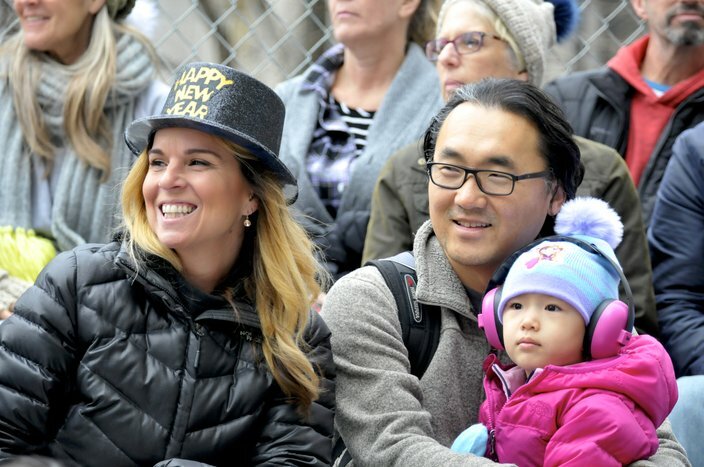 Stanley Jozefowski, 16 months old, watches an early performance from the comfort of a cart as he and three generations of the Jozefowski family participate with the Golden Sunrise New Years Brigade in the 119th Mummers Parade on Tuesday, Jan.1, 2019. 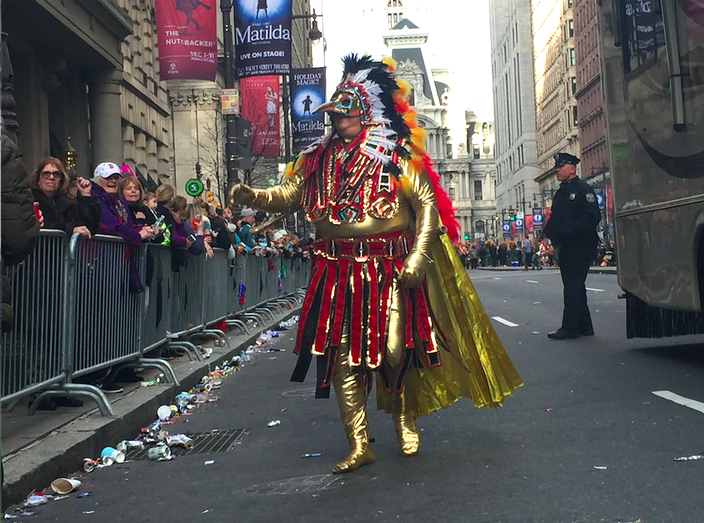 It's New Year's Day in Philadelphia and that means it's time for the 2019 Mummers Parade. 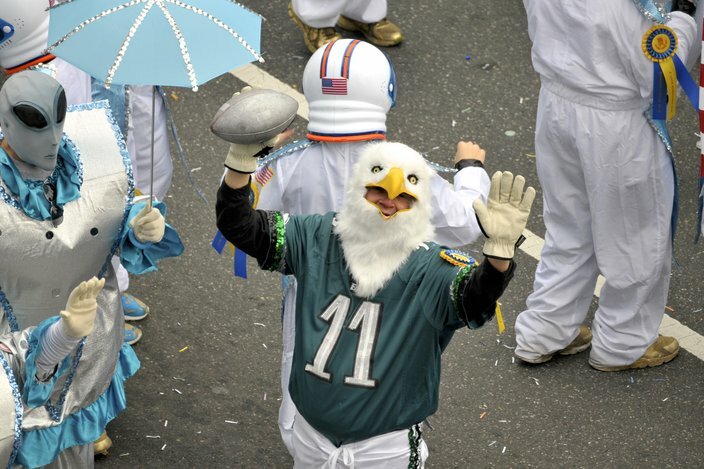 The mummers began strutting down South Broad Street a few hours ago. 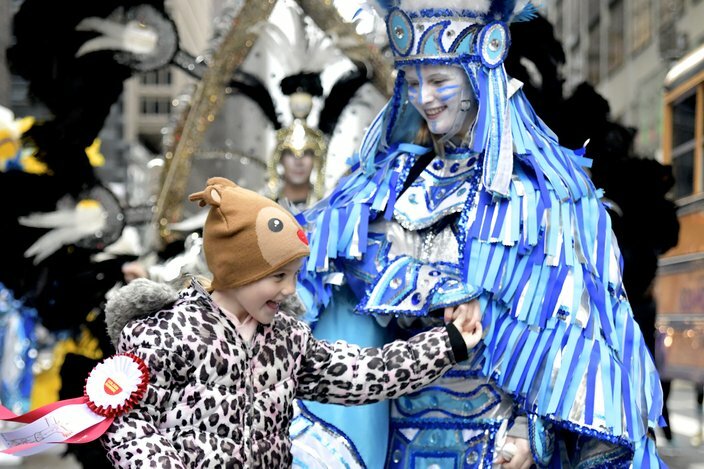 If you weren't able to make it street-side Tuesday morning and afternoon, here are some images from Bastiaan Slabbers and Brian Hickey showing the pageantry. 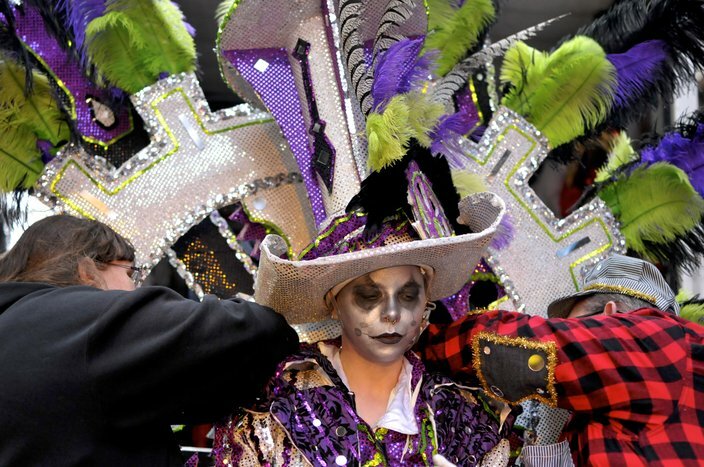 At the start of the route near City Hall, mummers prepare to strut down South Board Street during the 119th annual Mummers Parade on Tuesday Jan.1, 2019. 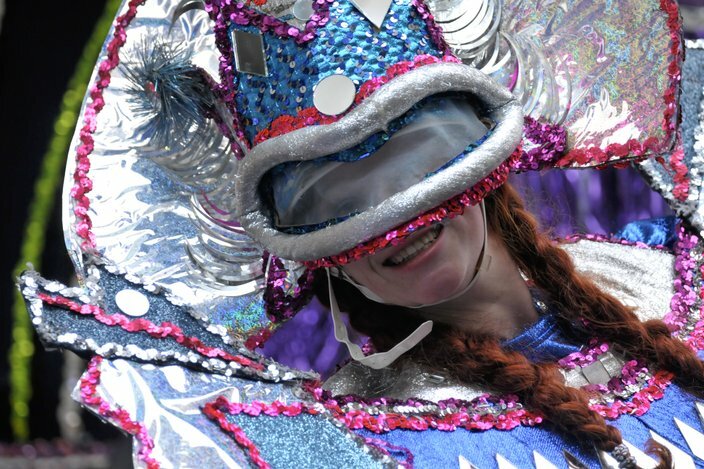 At the start of the route near City Hall, mummers prepare to strut down South Board Street during the 119th Mummers Parade on Tuesday, Jan.1, 2019. 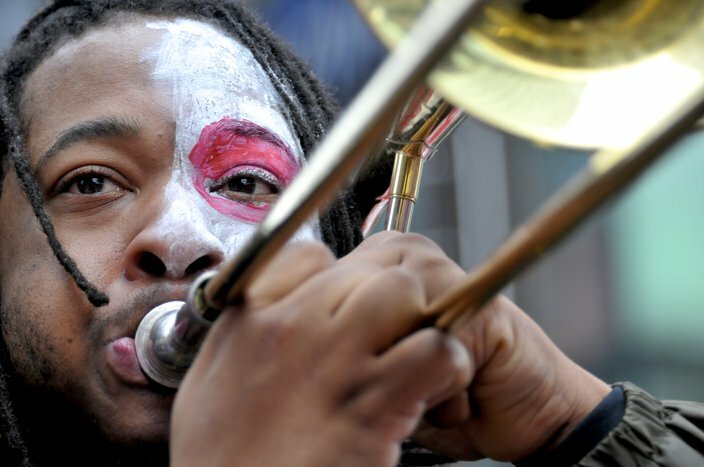 New Sound Brass band teams up with the Cara Liom New Years Brigade for the mummers strut on South Board Street in Philadelphia during the 119th Mummers Parade on Tuesday, Jan.1, 2019. 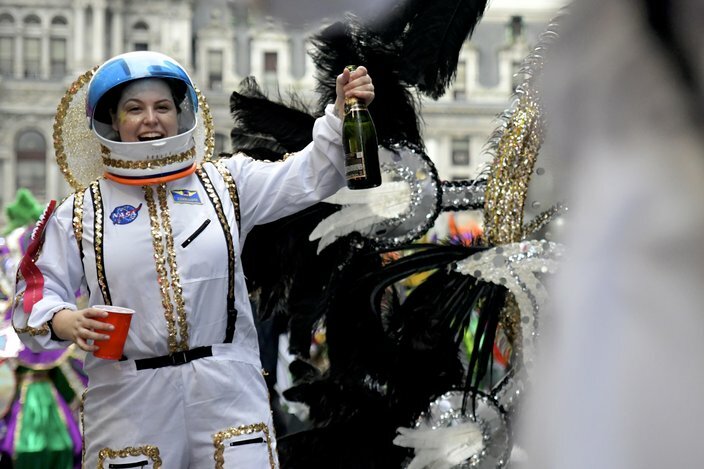 At the start of the route near City Hall, mummers prepare to strut down South Board Street during the 119th Mummers Parade in Philadelphia on Tuesday, Jan.1, 2019. 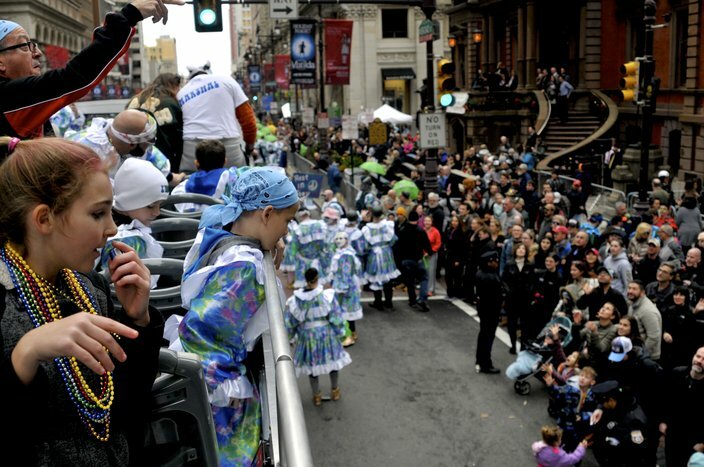 Spectators on the bleachers near Philadelphia City Hall watch a performance during the 119th Mummers Parade on Tuesday, Jan.1, 2019. 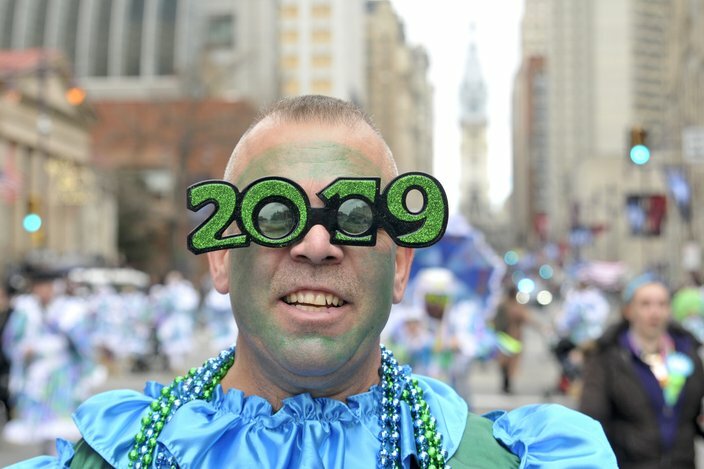 A spectator on the bleachers near Philadelphia City Hall watches the a performance during the 119th Mummers Parade on Tuesday Jan.1, 2019. 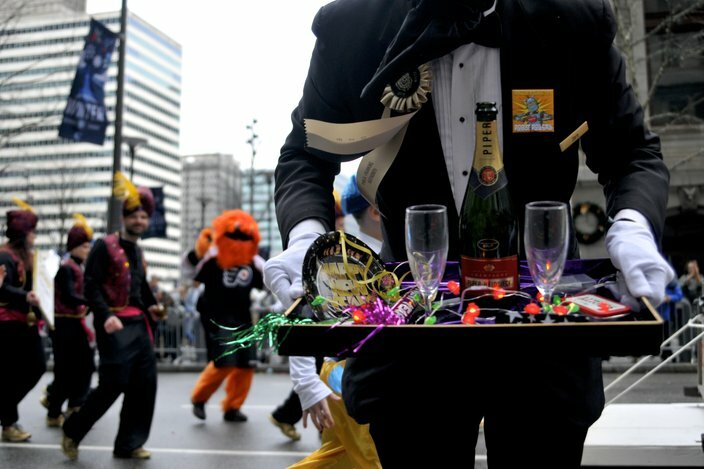 Members of Golden Sunrise ring in the new year with a toast toasts as they prepares to participate in 119th Mummers Parade on Tuesday, Jan.1, 2019. 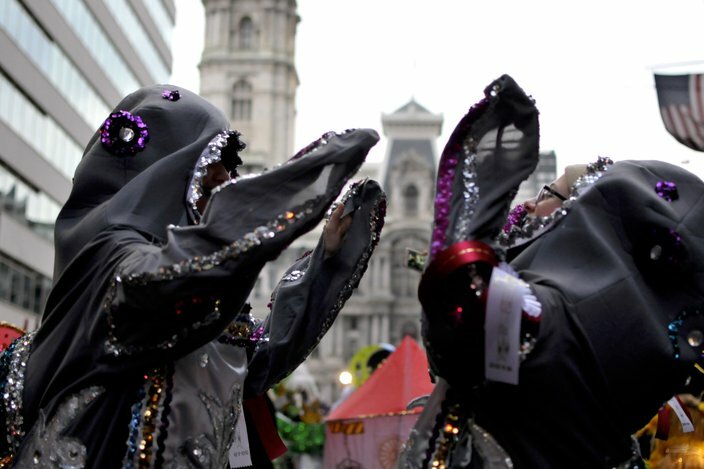 At the start of the route near Philadelphia City Hall, mummers prepare to strut down South Board Street during the 119th Mummers Parade on Tuesday, Jan.1, 2019. 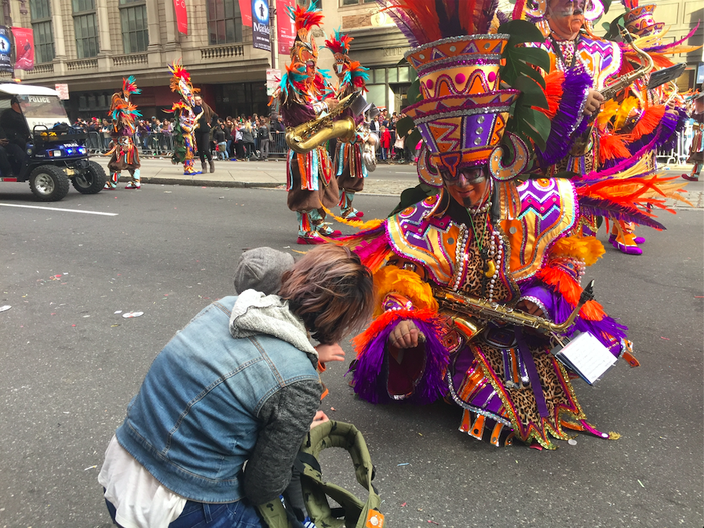 Helpers make last minute adjustments to a member of the Golden Sunrise New Years Brigade, ahead of the 119th Mummers Parade on Tuesday, Jan.1, 2019. 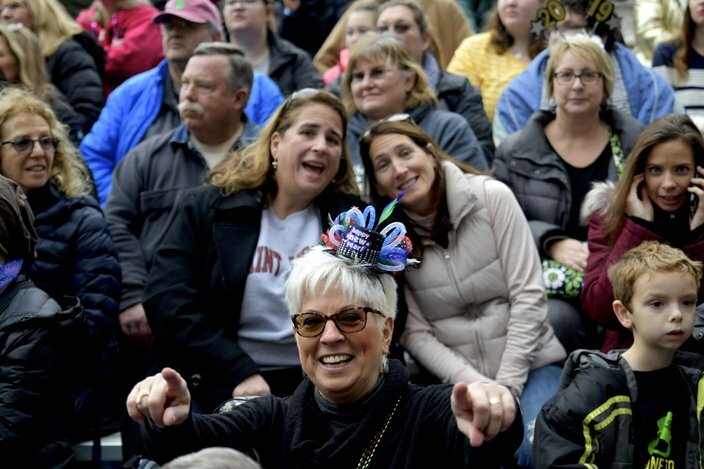 Spectators on the bleachers near Philadelphia City Hall watch the the 119th Mummers Parade on Tuesday Jan.1, 2019. 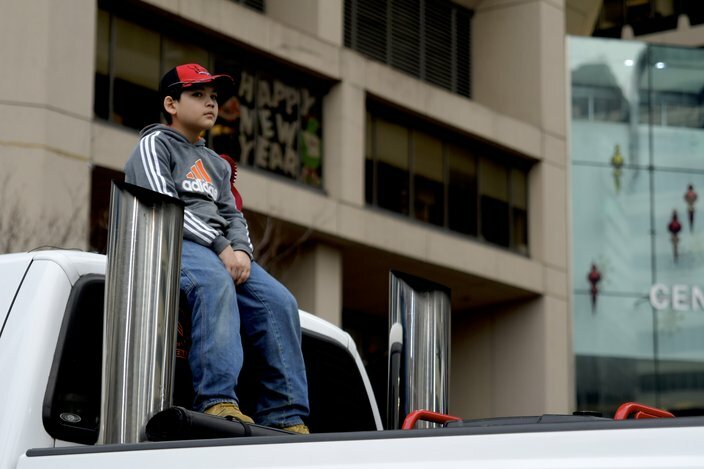 A young spectator looks on as the mummers prepare to strut on South Board Street during the 119th Mummers Parade on Tuesday, Jan.1, 2019. 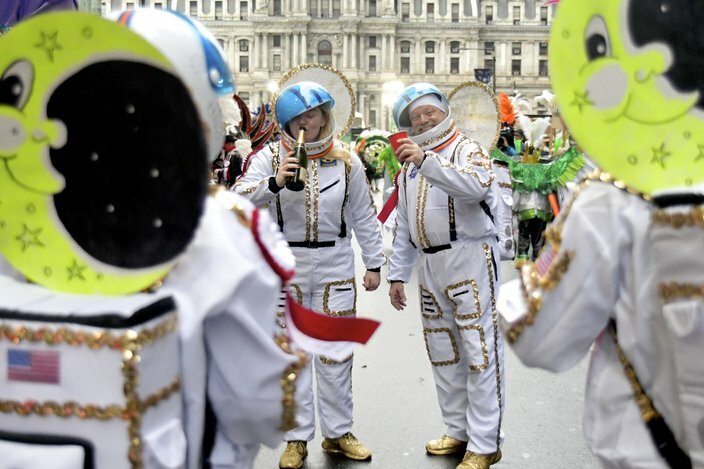 At the start of the route near City Hall, mummers prepare to strut down South Board Street during the 119th Mummers Parade on Tuesday Jan.1, 2019. 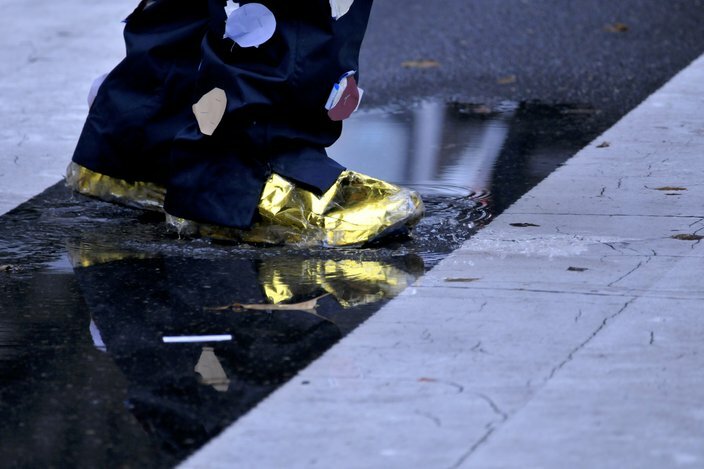 A mummer wearing golden slippers steps in a puddle during the 119th Mummers Parade in Philadelphia on Tuesday, Jan.1, 2019. 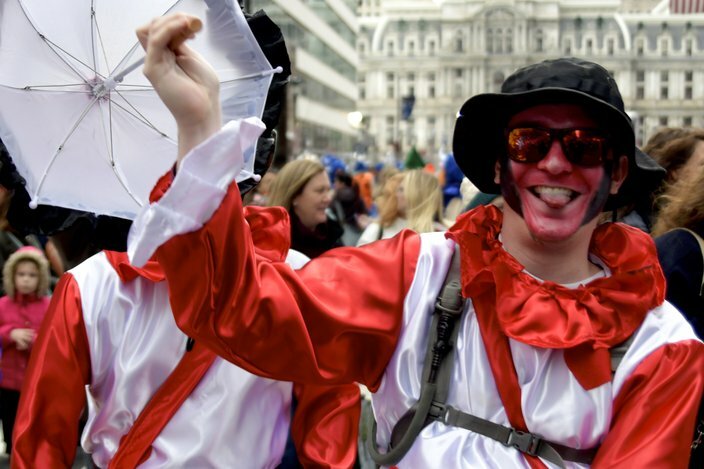 At the start of the route near Philadelphia City Hall, mummers prepare to strut down South Board Street during the 119th annual Mummers Parade on Tuesday, Jan.1, 2019. 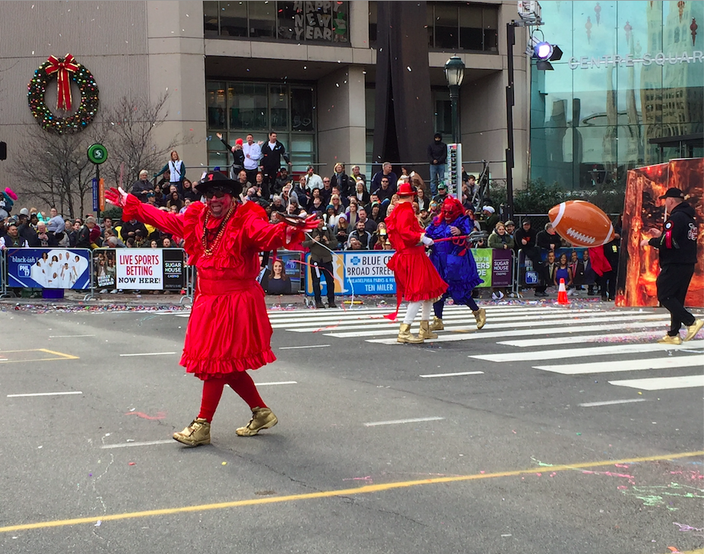 An inflatable football drifted from the crowd into the Jesters N.Y.B. 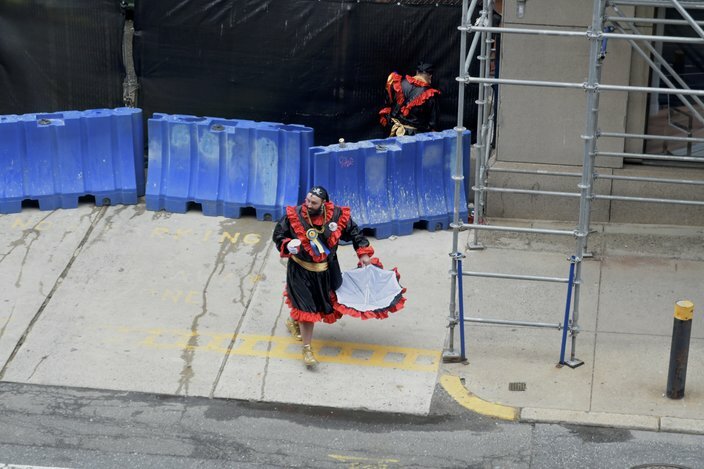 performance for which the song 'Devil with the Blue Dress On' played as a Mummer dressed as a devil in a blue dress frolicked in the street. 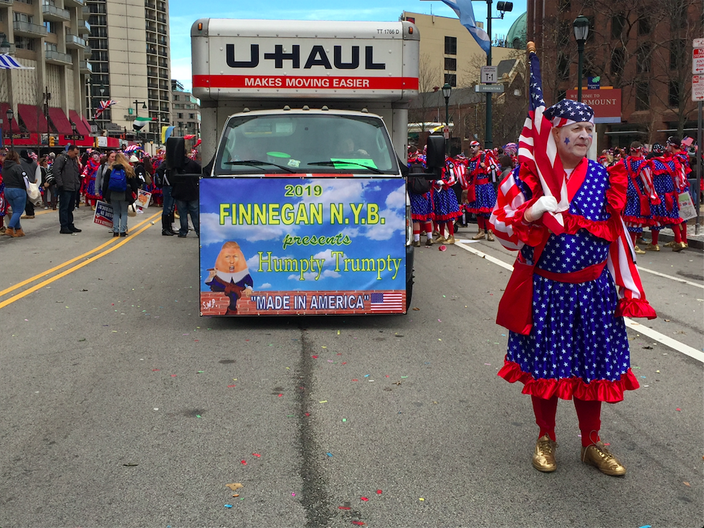 Donald Trump was recurring theme during the 2019 Mummers Parade, including the Finnegan New Year's Brigade Comic Club's performance. 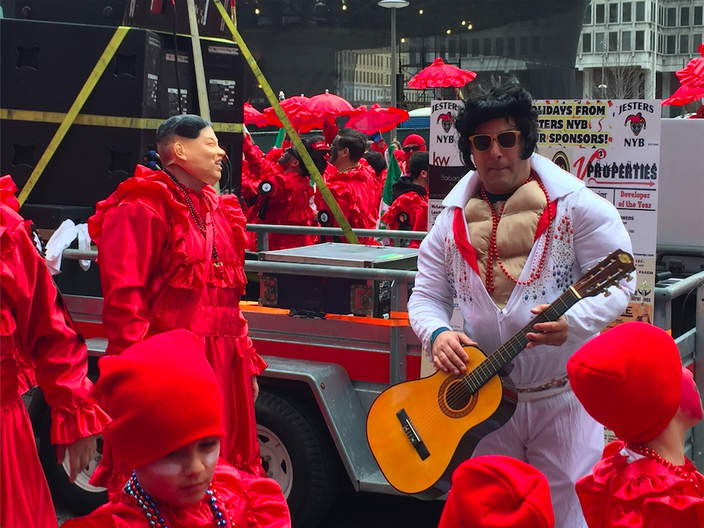 Elvis and Kim Jong-un were part of the Jesters N.Y.B. New Year's Day performance. 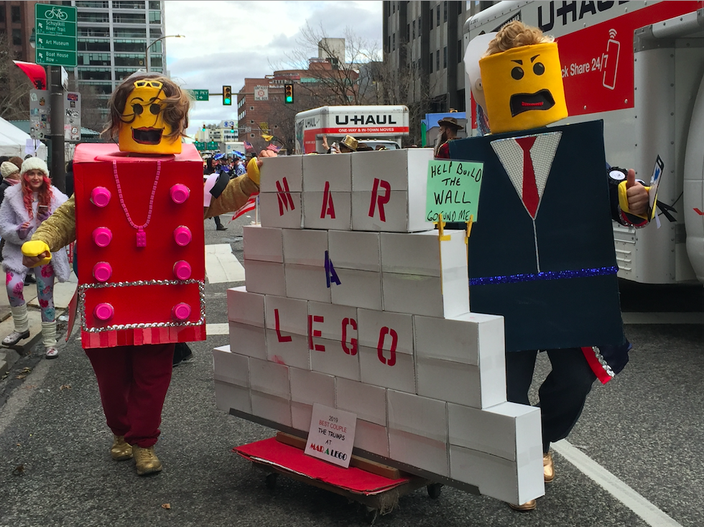 Near the front of the Pineland Mummers truck, a pair of 'Lego' strutters deemed themselves the 'best couple' at Mar A Lego (get it?). 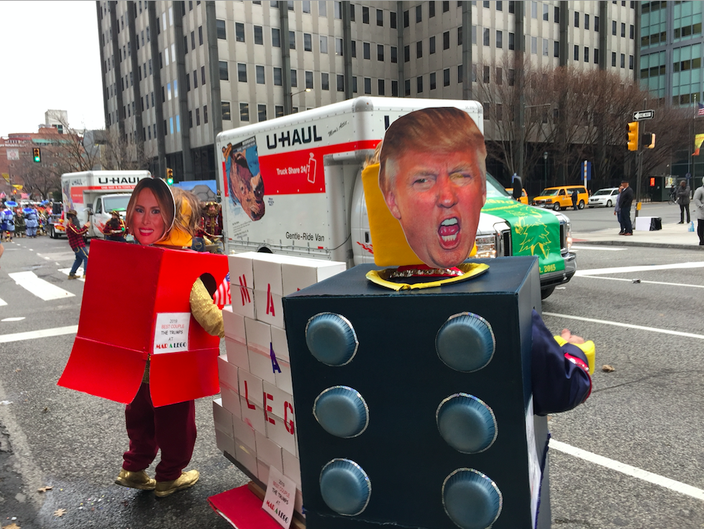 The 'Lego' Mummers wore Donald and Melania Trump masks as they prepared for their moment in front of the judge's booth near City Hall. 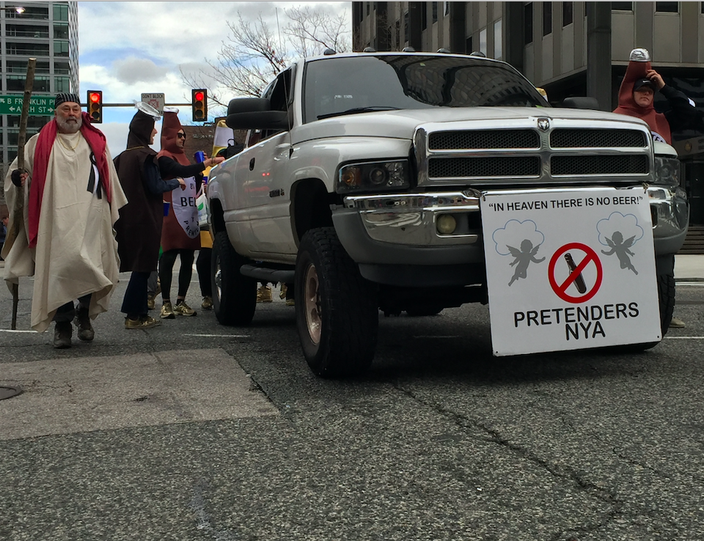 Well that doesn't sound like all that fun of a place, Pretenders N.Y.A. 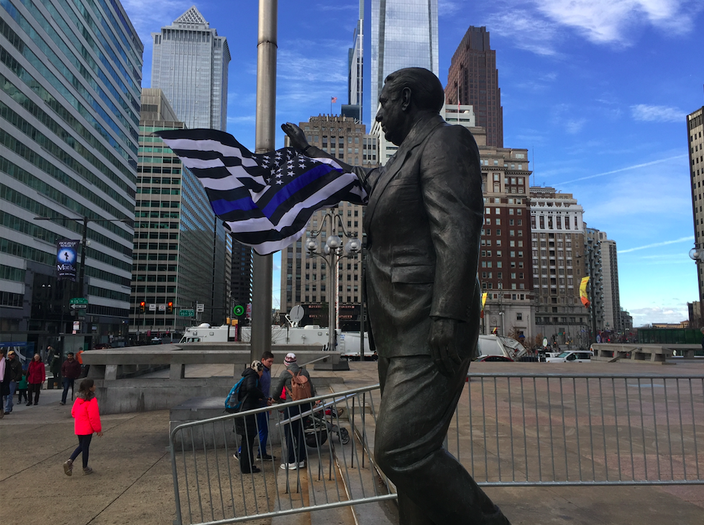 Just off the parade route, a 'Blue Lives Matter' flag is tied to the Frank Rizzo statue outside the Municipal Services Building. 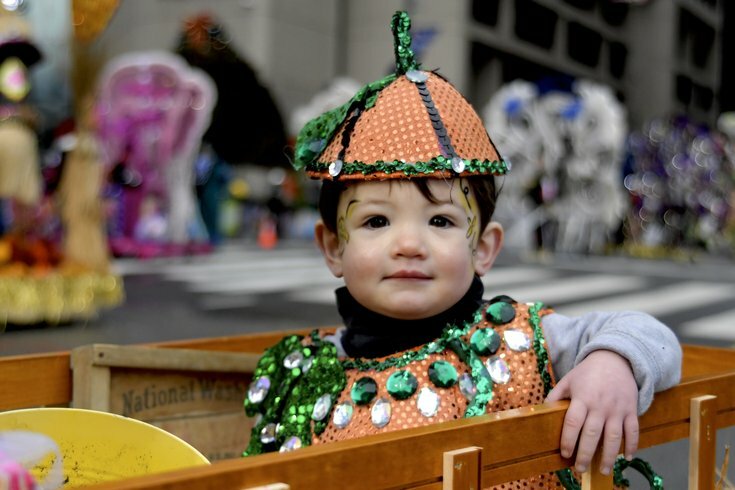 A young Mummers Parade attendee tries to figure out his new Froggy Carr umbrella as a member of the wench brigade poses for a photo with him near the Kimmel Center. 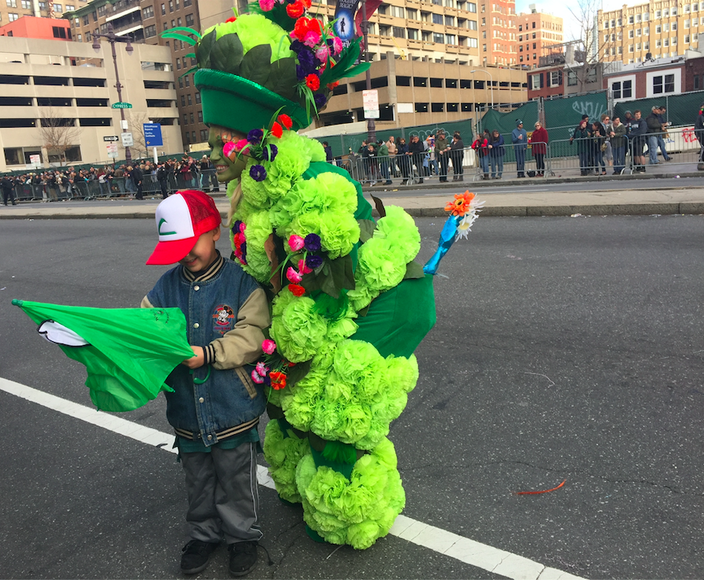 A member of the Aqua String Band greets a young fan near Broad and Walnut streets during a brief break in the parade on New Year's Day 2019. 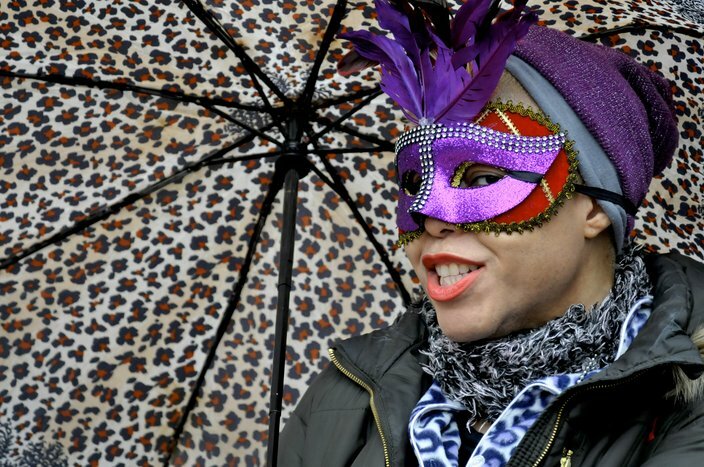 A member of the Greater Overbrook String Band strolls down Broad Street, which was packed on both sides on an unseasonably warm New Year's Day. 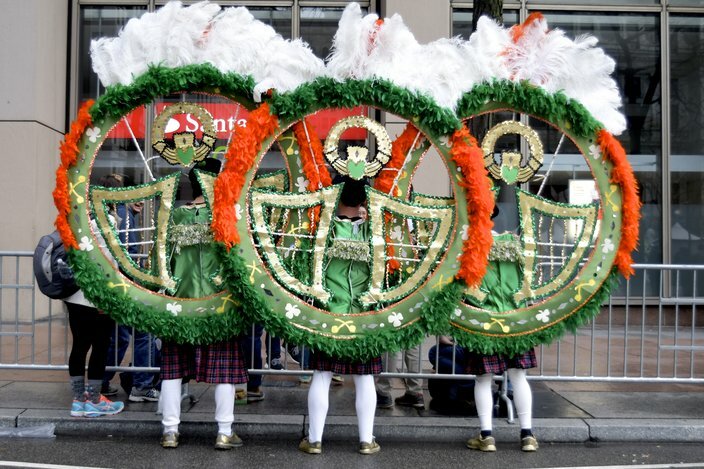 Mummers ring in the new year with a strut down South Board Street during the 119th Mummers Parade on Tuesday Jan.1, 2019. 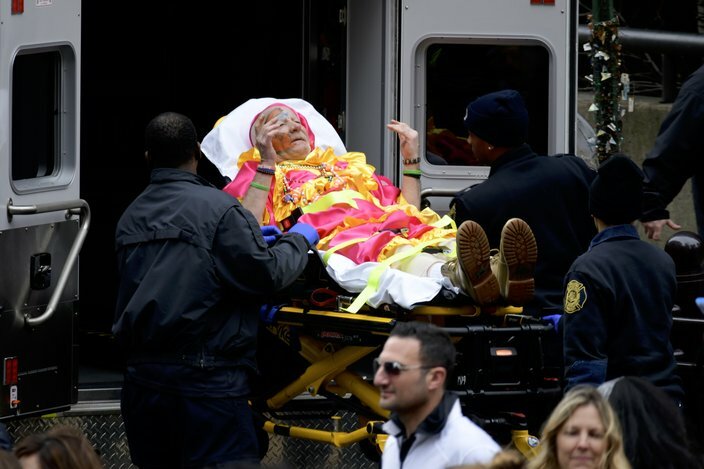 Medics take care of an unidentified person in Mummer's attire during the 119th Mummers Parade on Tuesday Jan.1, 2019. 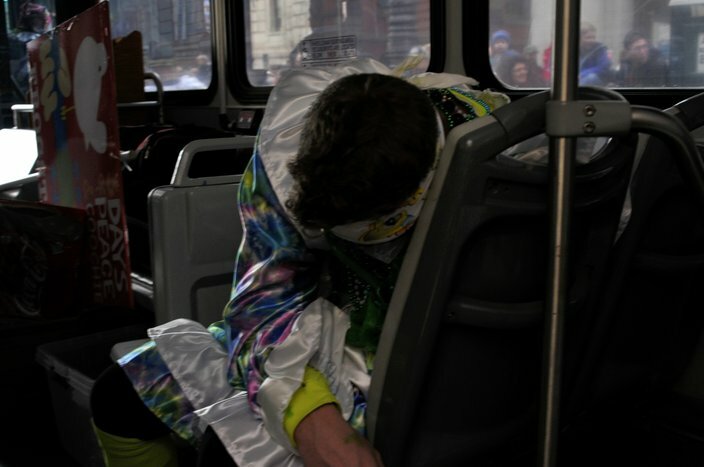 An unidentified member of the Froggy Carr club rests onboard a double-decker bus while the other members of his group strut down South Board Street during the 119th Mummers Parade on Tuesday Jan.1, 2019. 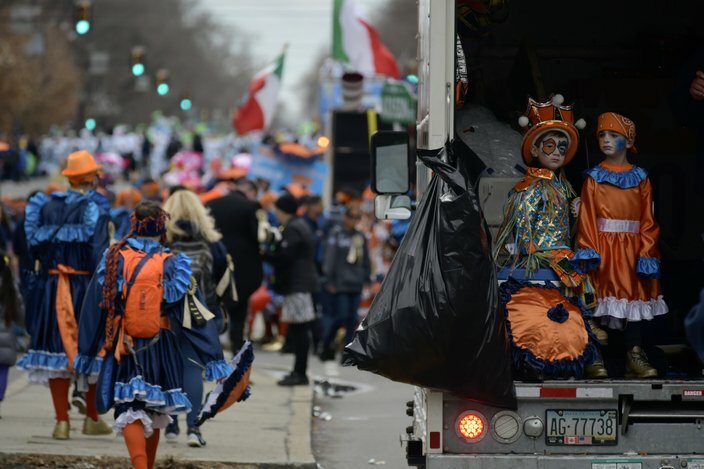 Man wearing a mummers costume is seen making an unsanctioned stop along the route of the 119th Mummers Parade in Philadelphia on Tuesday Jan.1, 2019. 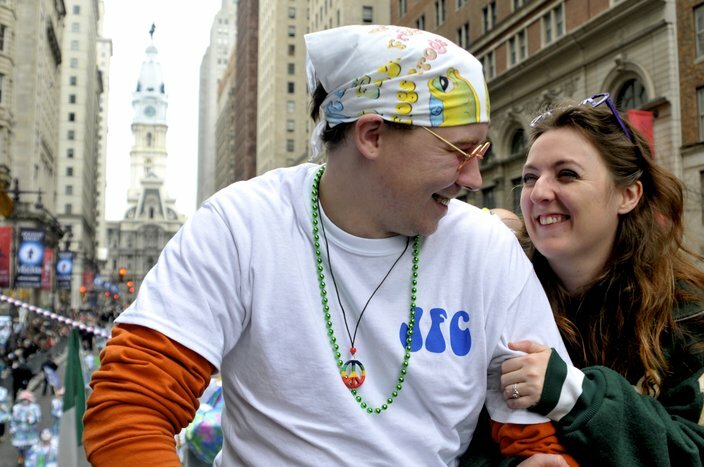 Newly engaged couple Doug Warren and Kayla Haughey ride atop a double-decker bus trailing the Froggy Carr brigade during the 119th Mummers Parade in Philadelphia on Tuesday Jan.1, 2019. 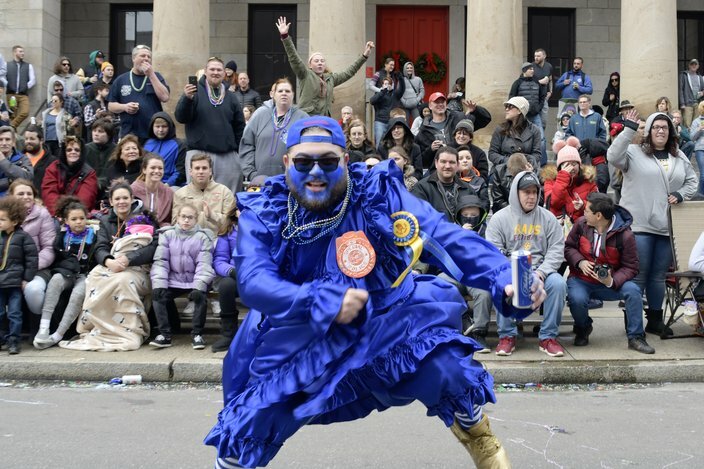 Chris Moscatelli, Jr., of South Philadelphia and member of the Golden Slippers club, entertains the crowd as mummers strut down South Board Street during the 119th Mummers Parade in Philadelphia on Tuesday Jan.1, 2019. 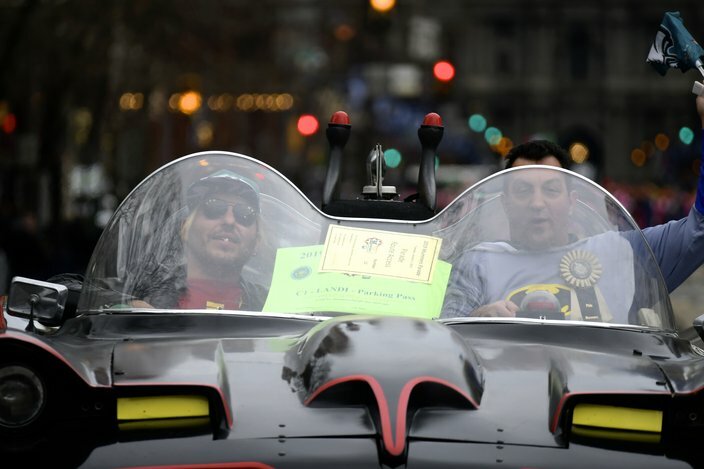 Peyton Simms and owner Tom Pollutri, of Wilmington, Del., roll down South Broad Street in a replica of the Batmobile from the 1966 TV series during the 119th Mummers Parade in Philadelphia on Tuesday Jan.1, 2019. 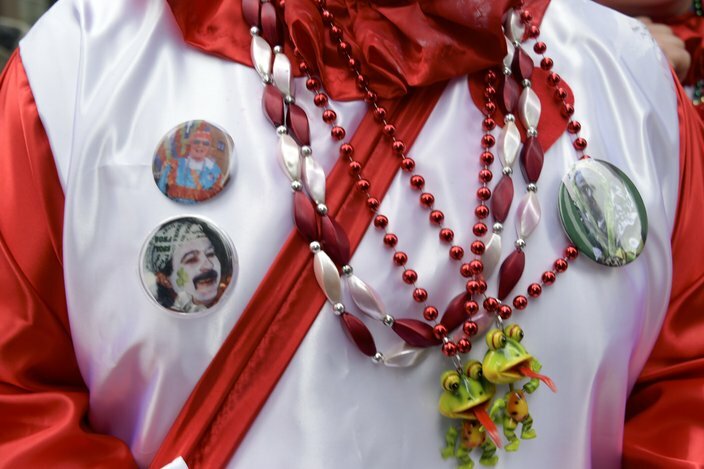 Beads are thrown in the crowd alongside the route as mummers strut down South Board Street during the 119th Mummers Parade on Tuesday Jan.1, 2019. 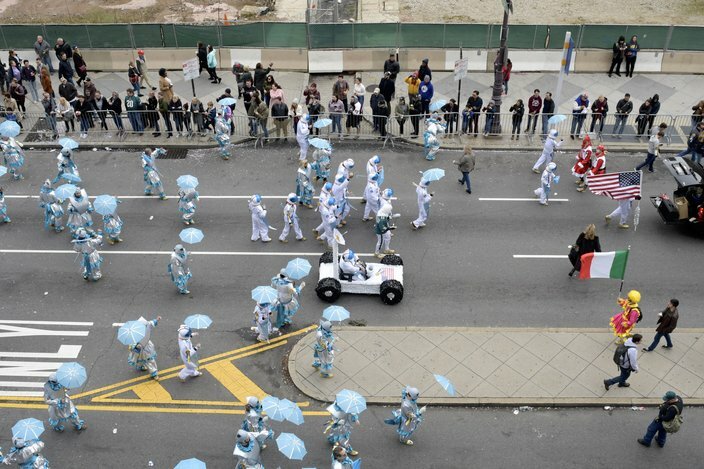 Mummers ring in the New Year with a strut down South Board Street during the 119th Mummers Parade on Tuesday, Jan.1, 2019. 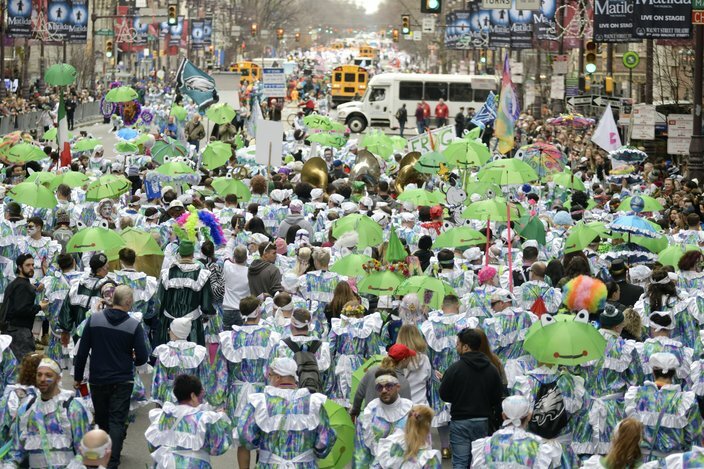 Members of the Froggy Carr New Years Association strut down South Board Street during the 119th annual Mummers Parade in Philadelphia on Tuesday Jan.1, 2019. 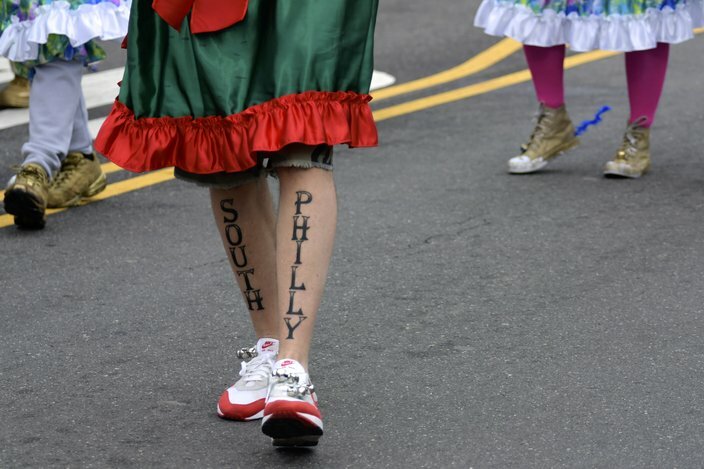 The words South Philly are tattooed on the shins of mummer participating in the 119th Mummers Parade on Tuesday, Jan.1, 2019.